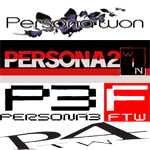 Finally, all of the Persona for the Win series in one convenient location. Containing the works of Persona Won, Persona 2 Win, Persona 3 FTW, and Persona 4TW. Now obviously as parody comics, all of the works do contain spoilers of their respective games. Read at your own risk.